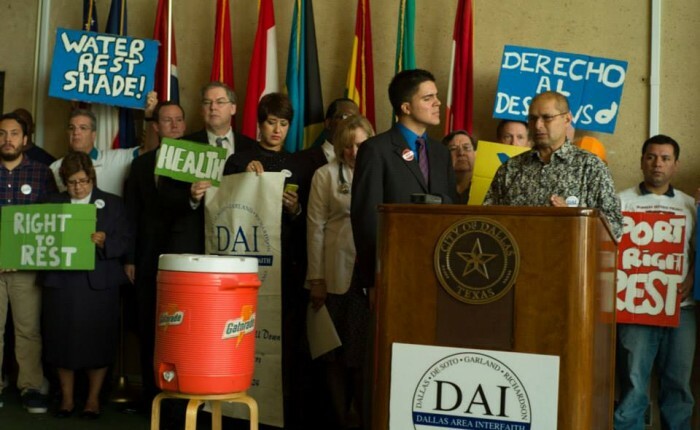 With renewed focus on local and winnable immigration reforms, Dallas Area Interfaith leaders are lending its significant muscle to a push for water breaks for construction workers and enforcement of wage theft laws. After DAI briefed the Dallas City Council on the need for a rest break ordinance to protect the health of construction workers, the Council took the step of charging the Economic Development Committee to work with stakeholders to craft an ordinance. Leaders simultaneously initiated a wage theft enforcement strategy with Representative Robert Alonzo, the County Sheriff’s office, County DA and Dallas Police in August, resulting in a commitment to enforce wage theft laws. DAI is set to provide the District Attorney and police with cases to prosecute and leaders are additionally developing a civic academy strategy to educate victims and perpetrators of wage theft.